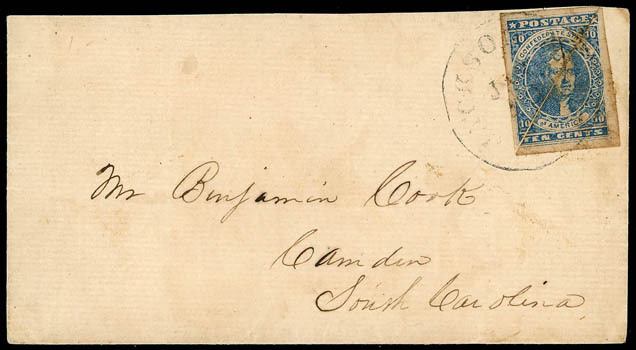 Confederacy, 1861, 10¢ black, Sperati reproduction, trial color die proof, proof die size on thin slightly glazed card, Sperati signature on front, purple handstamp on reverse with "16" and scarce yellow Sperati cachet, Very Fine. Scott No. 2R Estimate $400 - 600. 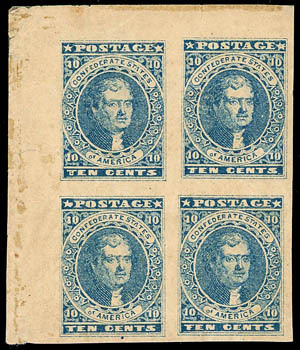 Confederacy, 1861, 10¢ blue, top left corner margin block of four, large margins all around, pos. 2 with 6-Point Star variety, pos. 11 circular flaw in upper left star (2-H-v8) and pos. 12 "FEN" cents variety, o.g., hinge remnants, small faults including tear at left into pos. 1 and some minor creases, Very Fine appearance. Scott No. 2 var. Estimate $750 - 1,000. 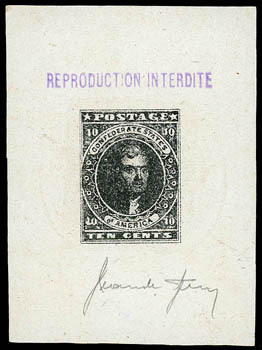 A SCARCE BLOCK SHOWING THREE DIFFERENT POSITION VARIETIES. 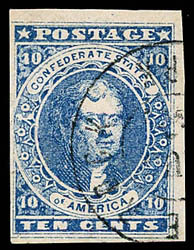 Confederacy, 1861, 10¢ blue, three large margins, cancelled by Little Rock Ark. 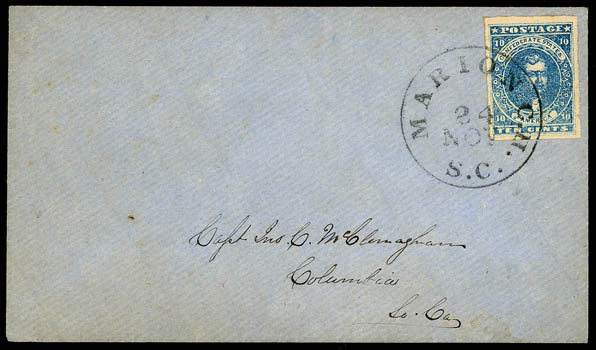 Aug. 1862 cds, Very Fine. Confederacy, 1862, 2¢ green, three ample margins, touched at bottom, tied by "Richmond Va. May 9, 1863" cds on drop-rate turned cover made from a small mourning envelope, the inside usage is hand carried with no postal markings, corner folded for display; barely reduced at right, fresh and Very Fine, ex-Howard P. Green; with 2000 C.S.A. certificate. 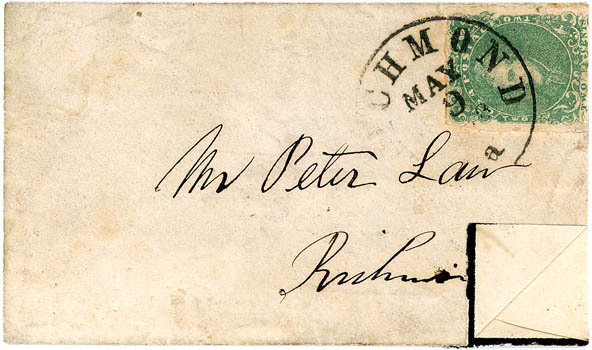 A RARE DROP LETTER TURNED USAGE OF THE 2¢ GREEN LITHOGRAPH. Confederacy, 1861, 10¢ blue, large margins all around, strong color, tied by sharp "Marion C.H., S.C., 24 Nov" cds on blue cover to Columbia S.C.; flap torn, an Extremely Fine gem use. 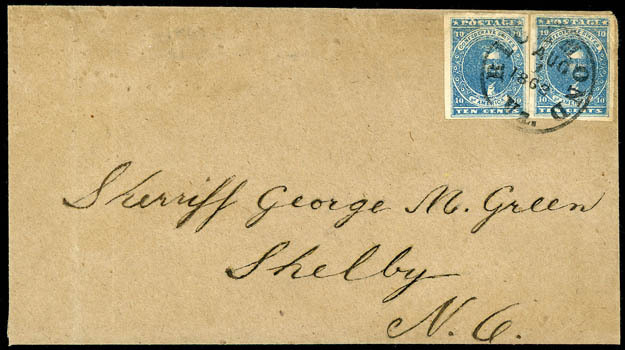 Confederacy, 1861, 10¢ blue, two four margin singles, tied "Richmond Va., Aug 1, 1862" cds on tan cover to Shelby N.C.; refolded, a Very Fine and scarce double-weight franking. 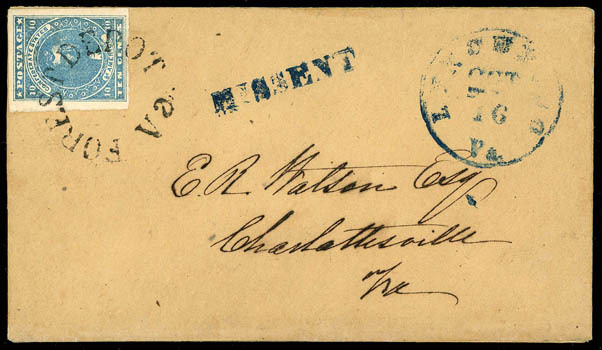 Confederacy, 1861, 10¢ blue, four large margins except close at bottom, tied by fancy rimless "Forest Depot, Va." postmark without date on buff cover to Charlottesville Va., blue "Lynchburg Va. Oct 16" cds and matching "MISSENT" straightline, Very Fine and choice use. 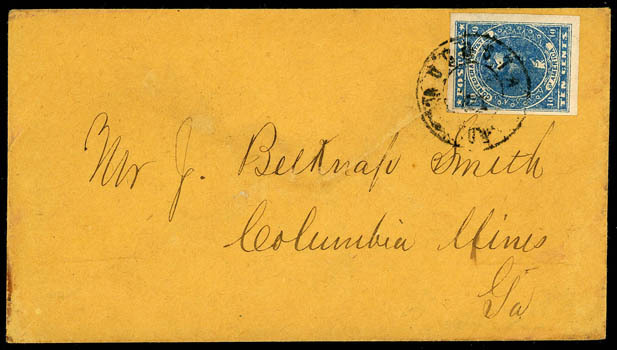 Confederacy, 1861, 10¢ blue, full to mostly large margins, rich color, tied by "Augusta Ga." double-circle datestamp on orange buff cover to Columbia Mines, Ga., Very Fine and choice. 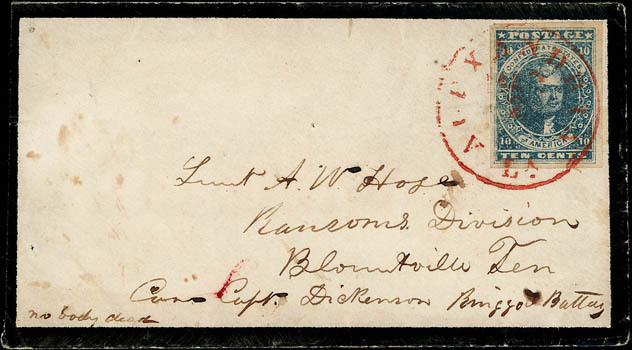 Confederacy, 1861, 10¢ blue, ample to large margins, tied by red "Alexandria, La., Mar 2" cds on mourning cover to soldier in Ransoms Division in Blountville, Tenn. "Care Capt Dickenson, Ringgold Battery", endorsed "no body dead" at lower left, Very Fine. Confederacy, 1861, 10¢ blue, large margins, diagonally bisected and both halves affixed on cover to Camden, S.C., tied by light Jackson, Miss cds, Very Fine and unusual.